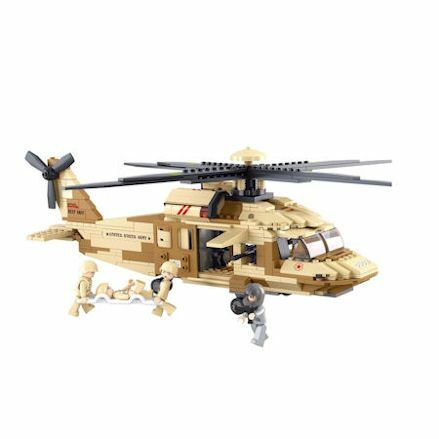 Go to battle in the air, sea and land with a new kind of army, namely Sluban toys offering you ‘build it your self' construction bricks - compatible with, but cheaper than Lego. 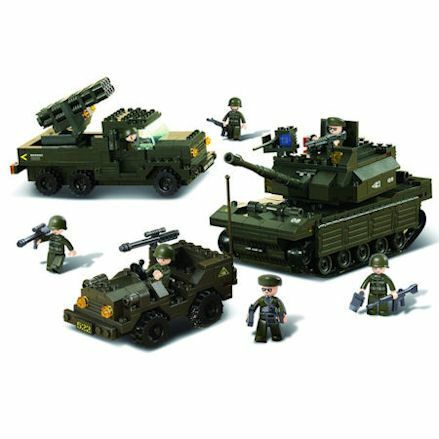 Suban army offer well over 68 army toys, from aircraft carrier groups to tanks, armoured vehicles, artillery, assault boats, landing crafts, transport, mobile rocket launchers, airplanes, helicopters and headquarters. If you can think of it, they probably have it. Based in the Netherlands, Sluban is a toy manufacturer with a product range of 20, well the product range is likely to expand much further as they find a niche in the construction brick market. 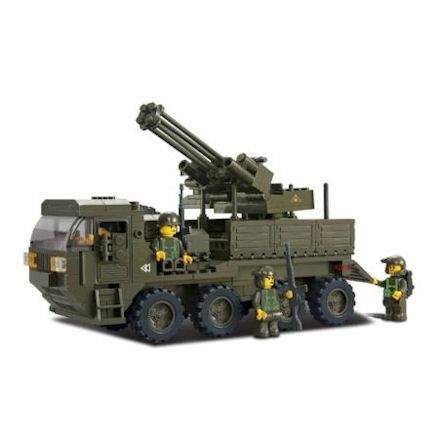 And as you may know, LEGO do not make army bricks - and Sluban army have you covered - so let's take a look at the range. 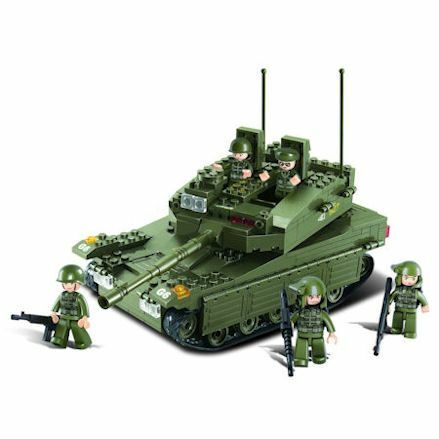 Search and browse the full Sluban Army range with Amazon.co.uk as they carry the full collection, they're compatible with Lego, and unlike Lego carry brick military sets. By aircraft carrier groups, we mean just the aircraft carrier itself, that can launch attacks on the enemy from the sea. 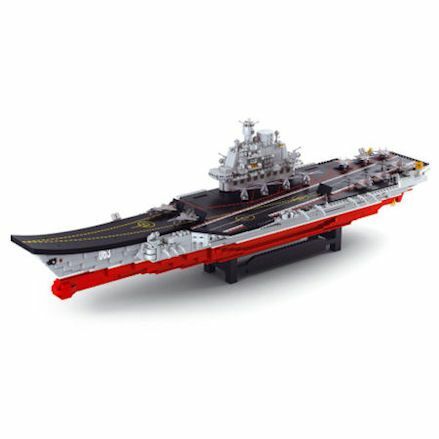 Sluban aircraft carriers measure approximately 80.5 x 42.5 x 9cm, with up to a whooping 1875 bricks in each set. Here you can use the landing deck to land and take off with smaller Sluban fighter jets and helicopters. When you choose a Sluban tank to go to battle with, you can rest assured each one comes with two or more figures. Well stand alone tanks are available, they are also available in sets. Each tank can measure about 33 x 23.7 x 5.4cm with 224 bricks. If you're interested the LEGO tanks available, bare in mind they do not develop tanks at all, or any military sets come to think of it, so Sluban is a good alternative. You can't go to war without support from the air, with up to three war planes from fighter jets to stealth. The plane will come with a pilot and ground crew with accessories. 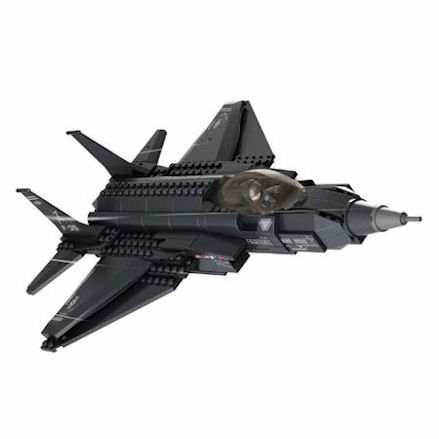 Each jet measures about 28.5 x 23.7 x 5.4cm with 142 or more construction bricks. Once built you're in for a treat with Sluban fighters, they can be used to for good or bad, with modern fighters to older models. You'll need Sluban army helicopters for support on the ground, for heavy transport and attack, so consider selection one from seven available. Will measure approximately 33 x 28.5 x 6.7cm with 293 bricks. You can attack with Apache-like helicopters, or single seated choppers with rockets on the side. There's also troop carrying heli's like chinooks and blackhawk's, and well they appear to look like such popular helicopters, they're not branded this way. With up to five sets available, some are static well others like anti-tank guns come on wheels and can be towed to position. Measures: 38 x 28.5 x 6.7cm with 316 bricks and figures. 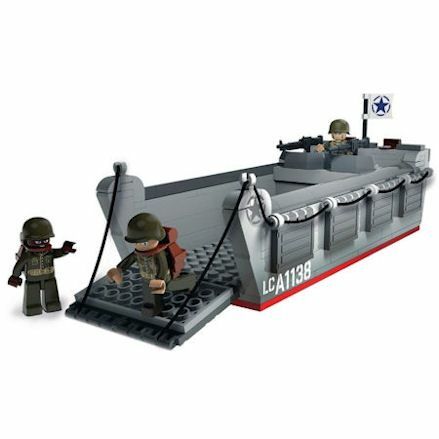 Sluban army boats include landing crafts and destroyers complete with figures and accessories. Well the destroyers are big, measuring 57 x 38 x 9cm with 641 bricks, the smaller attack boats measure 23.7 x 14.1 x 4.8 with just just 97 bricks. Attack boats are built for a single Sluban figure to take control, well the bigger boats can carry a whole crew on the deck. 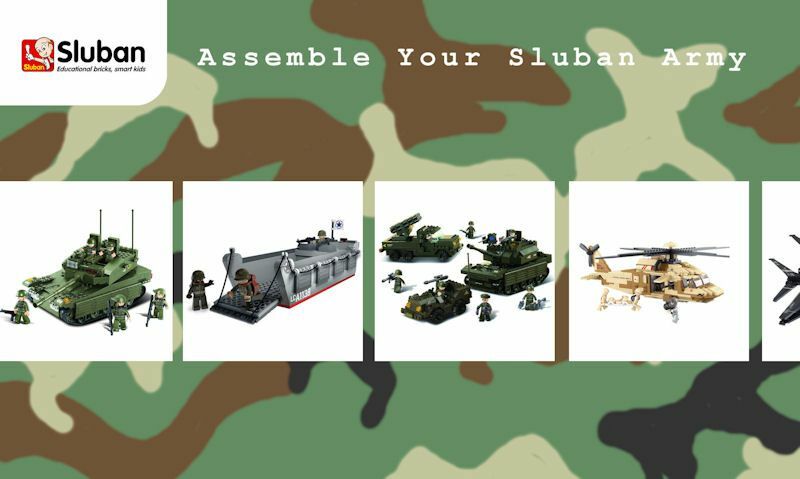 You could build you army in one go with Sluban army sets, with an army vehicle pairing or sets including vehicles, aircrafts, figures and buildings - all in one. To start with, every available set mostly comes with a figure included, then the're additional extras such as guns and more figures. So in case of the vehicles, it will come with a figure for driving, then perhaps some sort of anti-tank trailer for towing; likewise, the aircrafts should come with a pilot.